Also known as the Westmoreland Lofts, West40 is Toronto’s newest loft conversion, in Dovercourt Park. 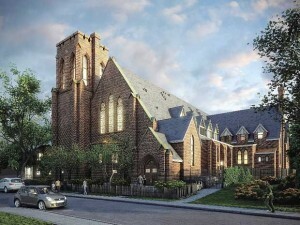 Located at Bloor Street West and Westmoreland Avenue (40 Westmoreland Ave), Dog Day Developers is converting a heritage designated century-old church into hard loft residences. Dog Day Developers is a boutique firm that specializes in the design, re-development and construction of unique, architectural, historical buildings. West40 will have only 17 units, which will be carved into the original structure. Each suite will have its own private access from outdside and the layouts will be 3 or 4 storeys, incorporating some of the church’s original features. Architects Asen Vitko and W. A. Langton have combined history, grand architecture and urban living into this unique project. West40 has been designed with attention to brick detailing, a stunning bold tower and Tudor-arched openings. The style is distinguished from the late 19th century Gothic Revival by its reduced scale and early medieval English architecture design elements. Suite interiors, designed by Cherie Stinson, will include soaring cathedral ceilings up to 33 feet, original brick masonry, hammer-head wooden trusses, classic stone columns, historic capitals, and Gothic brick arches and windows. Each suite has a unique layout, and they range in size from 1178 sq ft to 1986 sq ft.
Prices are starting in the $700,000 range to over $1 million, and includes one parking space. >>Click here to contact me if your are intersted in this project, or any other Toronto loft or condo development.